Make your next children's birthday party unforgettable! Get the low-down on the best children's entertainment out there and all the facts that you need to know. If you have scheduled your party for a few hours and you have more than five children on your hands, you will find that entertainment quickly becomes a necessity! Booking an entertainer need not be an expensive option for you either, so read on before you write the idea off! A simple rule to follow is to check out the entertainer before you hire them for the party. If it is at all possible, get a personal recommendation. Your best resource will be the other parents. Consult them and ask about their recent experiences and if they know of any particularly good children's party entertainers in the local area. Doing your research is important - there are so many types of entertainers out there and you need to make sure that the service matches your expectations. For example, some will run the whole show for you, organising the games and keeping the party going throughout the day. Conversely, other entertainers may only provide separate and distinct activities like a magic show or face painting, leaving you to rally the troops for the rest of the time. One of the most important factors to consider is the age group of the guests. Ever heard of anyone being afraid of a clown? Yes - those phobias do exist and this is especially the case with young children so think twice before you book a clown for your party! The under threes have a short attention span and they need quick bursts of fun that can keep them busy. Get an entertainer who changes the activity every 15-20 minutes or so - any longer and you are going to have a disgruntled group! If the party has a mixed age group then the general rule should be to get entertainment for the youngest partygoers at the party. If you don't cater to their needs then you will simply end up with a bunch of upset toddlers who will quickly ruin proceedings for everyone else! So What Entertainment Should you Book? Toddlers don't need a main event, lots of small activities will keep them busy. 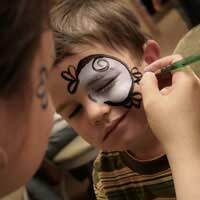 Think about hiring a face painter - every child, and even adult, will release their creative side. Lay on a paddling pool if it is warm. If not, some paints and some paper or simple playdoh will suffice. This is an age group where you can hire a magician. Test out the magician's tricks beforehand though. Even youngsters of 8 can be cynical if the act isn't slick enough! Also think about a fun themed party. Girly girls can follow a princess or fairy theme and pretend to be something magical for the day. Alternatively a bouncy castle is always a fun idea that will get even the shyest guest going. Don't forget the party games either. Pass the parcel is still a winner - especially if the parcel has some great prizes hidden beneath its layers! Once you have decided on your entertainer, sort out the details. Book well in advance - most birthday parties and other similar children's parties are held on Saturday's and you might find yourself competing with lots of other parents! Don't be afraid of agreeing the terms in writing. Confirm the date, time, duration of entertainment and the amount of money that they are going to spend. It might seem clinical but this is your back up should anything go wrong. Once the booking has been confirmed, the kids invited and the cake baked you can settle back and watch the party unfold!